Attractive colors and durable quality, these are the attributes that have made our range of decorative fringes popular in home furnishing accessories in the industry. The wide array of decorative fringes like Pom Pom fringes that we design and manufacture are made of rayon, polyester, cotton, staple,woolen etc. Our collection is available in varied sizes and colors. These decorative fringes are widely used in decorating different items like cushion cover, place mats, table mats, napkins, curtains, throws, ladies garments, pillows, handbags, purses, pouches, children wear, etc. *Good quality in competitive price. High quality with various styles. *Welcome to customer's design & size. We Can Make Any Size, Design, Colour You Required. Packaging Details: Approx 15 Days For M.O.Q. Standard package According To Customer's Request. Material - Polyester & acrylic. 1)Materials:all kinds of materials with different colors, beads, flakes. Size 1cms Tape & Pom Pom 1.5cms. 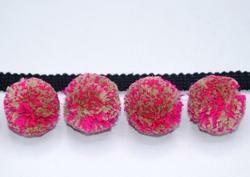 *Size:1cms Tape & Pom Pom 1.5cms. Size 30 pompom in metre. 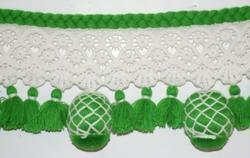 1)Size: 30 pompom in metre. 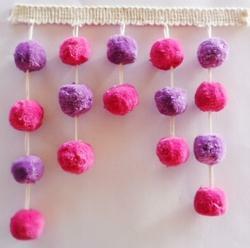 5)Pom Pom Fringe mainly used to decorate sofas, window curtains, cushions borders, craft projects, costumes and wedding ring pillows. 1)Size:1cms.Lace & Strands 7cms. ( Pom 24 ). 5)A beautiful Fringe can be used for multi-purpose. Can be used in cushion coves, Curtain. ladies apparels, etc. 7)Any colour & size we can make. 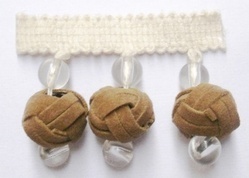 1)Size:1 cms.tape & Pom Pom 2cms. 7)Welcome to customer's design & colour. 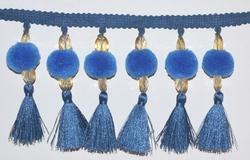 Looking for Pom Pom Fringe ?